Duffel bags are one of the best inventions in the world of travel gear. They are extremely versatile and in some cases are preferred over other gear that should be better suited for the job but somehow isn’t. We’ve compiled a list of 10 duffel bags that we believe are the best for each in their price range. They range all the way from inexpensive last minute duffels you can purchase, use one time and forget about after the fact up to some extremely pricey ones that you expect to have a lot of functionality and stand the test of time. We hope you agree with us on most of this list and if you don’t then no worries, we would love to hear your feedback in the comments below! 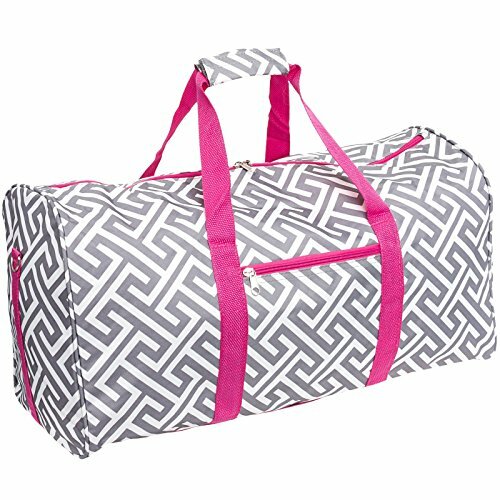 This travel cheer duffel bag is designed by Silverhooks. 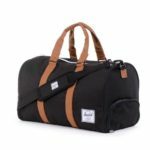 They surprisingly have this duffel bag in 44 different colors to choose from; and it doesn’t hurt that it’s the cheapest duffel bag on this list. This Silverhooks duffel bag is made of 600 denier polyester providing it modest durability while also keeping it extremely lightweight at only 1 pound. For those that have certain preferences on where products are made, this is imported. Other features of this duffel bag include a shoulder strap, carry handles that are able to be snapped together in place for easy carrying and an external zippered pocket to aid you in your organization. This bag is machine washable but is not waterproof; however, it dries fairly quickly. It’s ideal for use at the gym, as a carry-on, maybe a short road trip or perhaps to store some sports equipment and/or balls. If you need an inexpensive duffel bag quickly then look no further than this Silverhooks travel cheer duffel bag. 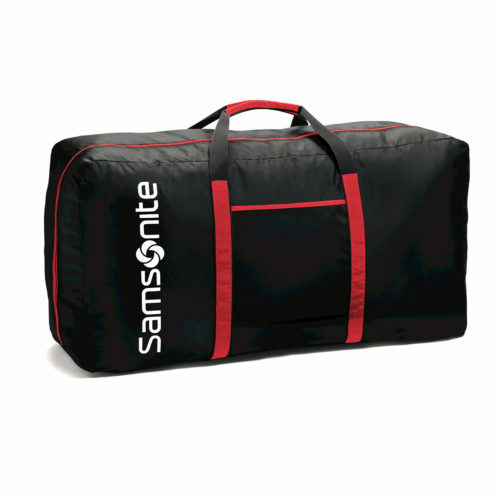 This is the Tote-A-Ton duffel bag by Samsonite. 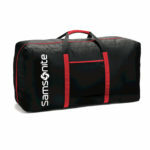 This particular duffel bag offered by Samsonite comes in 4 different colors for you to choose from, turquoise, black, purple and red. It is made from 400 denier nylon. This lightweight duffel bag is hand washable; however, we don’t suggest washing it in the washing machine. It also provides us with a small sense of organization as it provides a zippered pocket on the inside of the duffel which can be used for smaller items like your phone, charger, wallet etc. This is a big duffel bag. It holds as much as some car trunks as it has over 6000 cubic inches of space and did we mention it is durable. It’s tough enough to hold 50 pounds worth of gear regularly. Unfortunately with this large size comes the downside that it cannot be used as a carry on duffel bag. This duffel bag does not come with a built in lock or anything but you can use a TSA lock with the zippers if you’d like, either using something like a pad-lock or a key-lock. 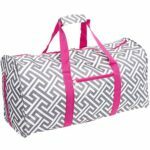 This duffel bag is ideal for traveling if you plan on taking lots of clothes with you or if you need to bring some gear along. It’s also great for sports equipment and gear. This is the Storm Undeniable II duffel bag by Under Armour. A company that needs no introduction but we’ll give them one anyways. 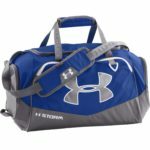 This Under Armour duffel bag is offered in 9 different colors for you to choose from and is made with 100% polyester. 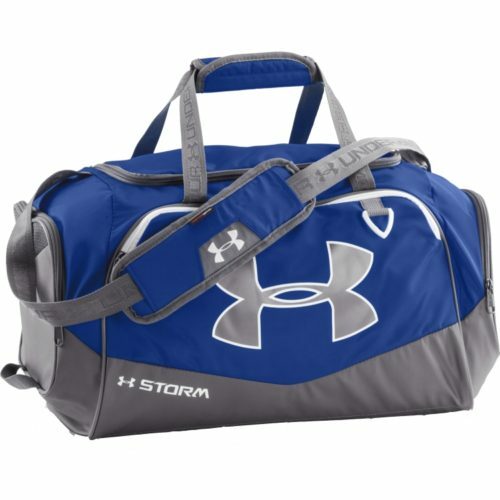 The name of the duffel bag, Storm Undeniable, is fitting as it’s built with their UA Storm technology which is built to battle the elements and has an extremely water-resistant finish. It also boasts a tough and abrasion resistant sides and bottom. The outside of the bag has a large front zippered pocket as well as two side pockets, one on each side, to provide excellent organization for a duffel bag. Under Armour also included an adjustable padded shoulder strap as well as a padded top grab handle to give you total comfort for whenever you need to tow this bag around. This bag is not machine washable so unfortunately you will have to clean by hand if you want to keep your duffel bag looking like new. This duffel bag is ideal for a short weekend trip, going to the gym or to take stuff with you to school. Again we have another company that needs no introduction, however, we’ll give one anyways. This is the Adidas Team Issue duffel bag. The Adidas duffel bag comes in a number of sizes for you to choose from: small, medium or large. We are covering the medium size for this article. Adidas also offers a number of styles for you to choose from, 14 in total! These duffel bags are made of 100% polyester which makes them strong, durable and very lightweight. 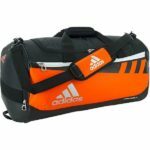 If you have any problems with them then don’t worry, Adidas offers this Team Issue duffel bag with a lifetime warranty. The exterior of the duffel bag has 3 outside zippered pockets, one on the front and one on both ends to provide a clear sense of organization for your gear. If you happen to get any of your gear dirty or wet, you can put it in the pocket that is PAK ventilated and keeps it separate from the other contents of your duffel bag. Adidas included an adjustable and removable padded shoulder strap to help you carry your duffel bag around if you get tired of carrying it by the handles. They also have what they call their hydroshield which gives the bag a water resistant bottom to protect your stuff from water seeping into the bottom. This duffel is ideal for the gym as you will be using that ventilated pocket I’m sure. It’s also great for school and to travel with, although if you fully pack the duffel bag you won’t be able to use it as a carry-on. 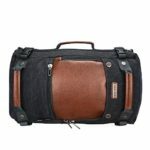 This is the Novel duffel bag by Herschel Supply Co. I’ve done a previous review of Herschel Supply Co and they are a great company with some fascinating products. This duffel bag is no exception. This Herschel Supply duffel bag is offered in numerous colors. In fact your toughest decision may be deciding what color to get instead of whether or not to buy. This Novel duffel bag has 28 color variations and all of them look great! The Novel duffel bag is made of polyester which makes it very lightweight but also gives it some durability so you can be a little rough with it. Outside we’ll find dual top carry handles as well as a removable padded shoulder strap to provide your hands some relief when you get tired of holding this duffel. The best feature of this duffel is actually on the bottom of and separate from the main compartment. It actually has its own little shoe holder built right into the side of the duffel bag. This makes it great for keeping everything organized and the main compartment even that much cleaner. Speaking of clean, you’ll want to make sure you wipe this bag with a damp cloth only and don’t use any soap and definitely don’t machine wash. Inside you’ll find one interior slip pocket so there won’t be many different surface areas you’ll have to worry about. This duffel bag is a little bit more classy in the sense you won’t be using it for the gym or sports and probably are not going to need to carry around a pair of shoes to class but it’s perfect for work as well as traveling, especially as a carry-on duffel bag. This is the Witzman men’s vintage canvas duffel bag and it is by far my favorite duffel bag. What makes it even better is that it’s extremely affordable and looks like it should cost 3 or 4 times what you actually pay for it. 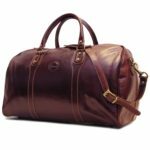 The Witzman duffel bag is offered in 2 different sizes and 4 different colors. We’ll be reviewing my favorite, the larger 21 inch black duffel bag. It is made of a premium cotton canvas and PU leather. This duffel bag is all about functionality and style. This vintage canvas duffel has two front zipper pockets, a side pocket, as well as, a laptop computer window for laptops 12 to 16 inches in size and a couple additional smaller pockets. Talk about organization! But aside from that the real beauty of this duffel bag lies in its versatility in how you get around with it. This duffel bag has 3 different ways to carry it. First you have the top handle that has a nice leather grip. Second, you have an adjustable and removable shoulder strap which is able to be hidden away by a zippered pocket. Finally, this duffel bag has hidden shoulder straps so you can use it like a backpack! The best feature of it is that you are able to hide them away behind a rolled down locked away backing so you won’t know they’re there unless you pull them out! Oddly enough this duffel bag is easy to clean as well since you are able to machine wash this bag in cold water separately from other items so there is no staining and then simply hang to dry! The Witzman is perfect for school, work, and especially travel as you can use it as a carry-on also. Honestly you should take this bag with you at all times, it just looks that cool! 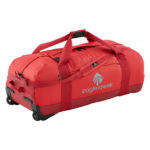 This is the No Matter What rolling duffel bag by Eagle Creek. This duffel bag steps the game up in terms of price and has a couple of great features to back it up. Firstly this duffel bag comes with a few color choices to pick from. You have firebrick, state blue, black, red clay and cobalt. It is made with a fabric that is actually called Bi-Tech, which makes it extra durable and provides excellent protection against the elements with its water proofing and abrasion resistance. It also provides this duffel a high strength to weight ratio. The exterior provides us with two sturdy, oversized wheels that give you another option on how you want to carry your gear around. There is also a removable and adjustable padded shoulder strap and two carrying handles that are able to be buttoned together. This bag is made for travelers and definitely those who plan on putting it through the trials. That’s why Eagle Creek made sure to build this duffel with compression straps, heavy duty d-rings and strong reinforced webbing on the straps so that nothing starts to come undone while you’re out exploring. This bag is great for those who are looking to go on adventures, the travelers out there that aren’t afraid to get their hands dirty. 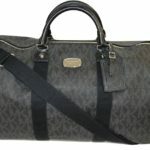 This is the Cenzo Vecchio duffle bag. 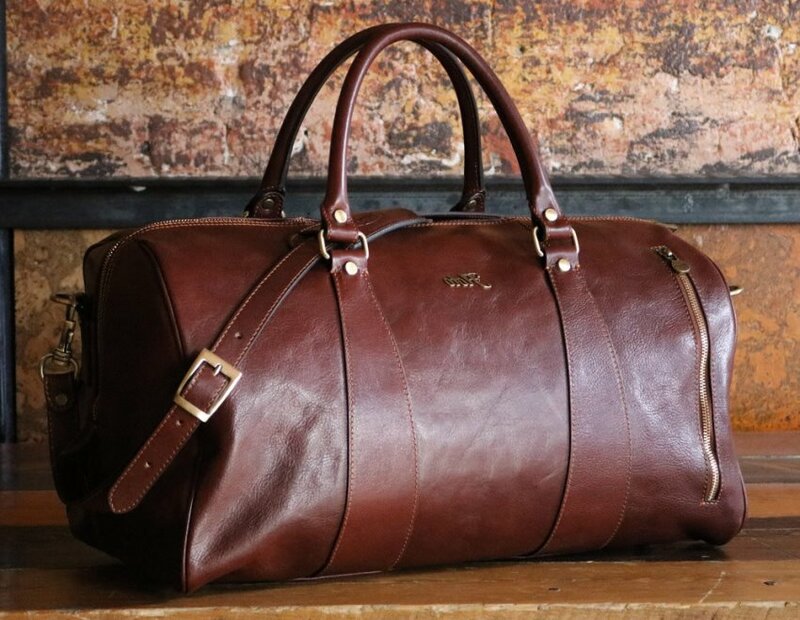 It is an Italian leather duffel bag that aims to please and it does just that. Now this duffel bag will set you back a little but it’s a highly rated duffel and one that simply deserves to be on this list. The Cenzo duffel bag is made with full grain calfskin leather. Full grain is the best of the best and on top of that, it’s soft leather as well, so it feels great. It only gets better as it ages! Inside of the duffel you’ll find cotton duck canvas lining to top it off. There are no pockets with this duffel bag as it’s truly that just a duffel bag but it looks fantastic and will last you for years. It comes with a detachable shoulder strap that is adjustable and two carry handles as well. The bottom of the duffel has metal studs in it which helps protect the bottom of the Cenzo duffel bag so it doesn’t get scratches from pavement or start getting soaked from water on the ground. This duffel is ideal for those looking to travel as well as to show off at work. It doesn’t hurt that it’s able to be used as a carry-on also. Trust me if you bought this duffel, you’d be showing it off all the time. As a quick note, let it air out for 24 hours after you receive it and it’ll be perfect! 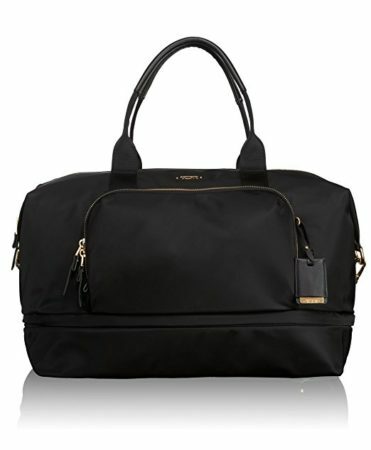 This is the Jet Set duffel bag by Michael Kors. It is easily one of the most recognizable brands on this list and demands a pretty penny. This particular piece of gear by Michael Kors comes in three colors to choose from; black, brown and white. The duffel is made from hard-wearing PVC which allows it to last for years on the road. While you’re on the road I’m sure you’ll want some organization also which the Michael Kors duffel bag provides in the form of multiple interior pockets. The exterior of the Jet Set duffel is free of any distraction and simply is covered in the recognizable Michael Kors pattern. It also has top handles and an optional shoulder strap in case you get tired of carrying it around. Want to travel in style and have a sense of pride, then look no further. 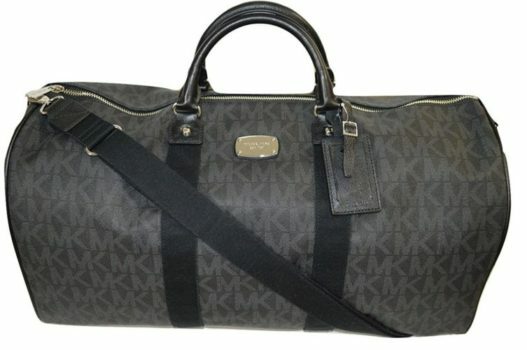 Ideal for both men and women, this Michael Kors duffel is perfect for traveling and works as a carry-on as well. Here we have it, the big boy on this list. Although this is not the most expensive duffel bag out there, not even remotely close, it’s still quite pricey and the most expensive for this list. 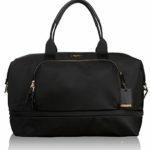 It’s the Tumi Voyageur Durban duffel bag. The Tumi duffel bag comes in just the one color and is made from nylon and has a synthetic lining which makes it durable and lightweight. With a hefty price tag you would expect some decent functionality out of this duffel and that’s exactly what you get. This is an expandable duffel that can provide you with extra storing capacity should you need! Simply zip-out the central compartment. The duffel also features a removable shoulder strap to go along with the two carry handles, a footed bottom to keep the bottom from getting scratched up and a sleeve on the back to allow you to slip it over rolling luggage as well. For optimal organization Tumi decided to add to the Voyageur Durban duffel; two interior zippered pockets, four slip pockets and an additional two pockets on the outside. The Tumi duffel bag is perfect for anyone who loves to travel as it is able to be used as a carry-on or even an additional bag to go under the seat when not expanded. You can also use this for work and for school; although I’m not sure many college students could afford this right now. If you’re worried it seems a little to feminine then check out this Tumi Alpha Bravo duffel bag that’s just as good for a similar price! While we were reviewing duffel bags we realized that what’s important and sets one bag apart from another is the functionality and honestly the design and style of the duffel bag. A duffel bag doesn’t have anything really crazy that blows your mind but if it looks great and does one or two things different from everyone else then that’s a change we can get behind. While pouring through hundreds of duffel bags we realized that there’s no one duffel bag that is perfect for everything, so we decided to include in this list a mixture of the best duffel bags for numerous situations. We did leave out any bag that was not durable or had quality issues. 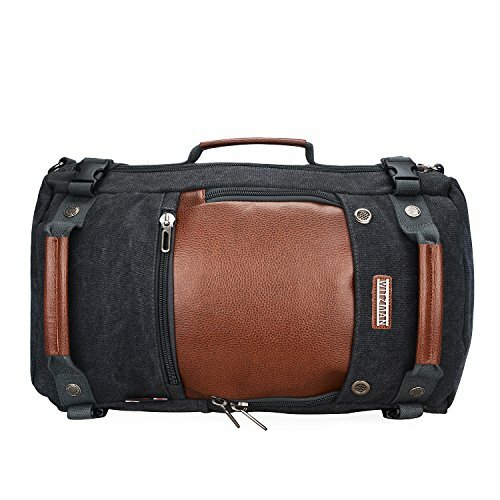 What’s the point in a great looking duffel or functional duffel if it’s falling apart and coming undone on you? We also made sure to look at the cost of the duffel as not everyone can afford our most expensive duffel on this list nor should they have to. We want to share the love to everyone! Let us know if there is a great duffel that should be mentioned or added to this list and we will gladly review it and consider it for this list!